Left-wing ex-Education Minister Benoit Hamon and ex-PM Manuel Valls will contest a run-off to become the Socialist candidate in France's presidential election in April. It was clear the pair would advance from a field of seven after half the votes were counted in Sunday's primary. The run-off will be held next Sunday. Opinion polls suggest that whoever wins will have little chance of reaching the final round of the presidential election in May. With half of the votes counted, Mr Hamon, 48, who was sacked by the government of President Francois Hollande, was ahead on 36.1%, with centrist Mr Valls, 54, on 31.2%. Another left-winger, Arnaud Montebourg, was in third place. But the extent of the top pair's lead ensured they would not be caught. Mr Valls said the choice in the second round would be "between an assured defeat and possible victory". Mr Hamon said voters had sent "a clear message of hope and revival and a desire to turn a new page in the history of the Left and of France". The BBC's Hugh Schofield in Paris says that in the second round Mr Hamon can count on the support of Mr Montebourg and so that should give him a clear advantage. 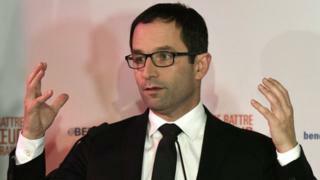 Our correspondent says Mr Hamon represents the angry, radical wing of the Socialist party - the part that totally disowns the legacy of President Hollande - his main idea being a basic minimum income to fight poverty. But, he says, however convincing his primary success, he is hobbled by the Socialist party's deep unpopularity in the country. Mr Hollande, whose approval rating has set a new low for the office, decided not to seek re-election. The Socialists' choice of nominee may also determine the future of popular independent candidate Emmanuel Macron, a charismatic ex-banker who appeals to the same moderate voters as Mr Valls. The final round in May is expected to become a battle between the conservative former Prime Minister Francois Fillon, and Marine Le Pen - leader of the far-right National Front (FN). Mr Fillon is widely expected to emerge as the winner. His proposals include cutting business taxes, relaxing labour laws, and scrapping France's 35-hour working week in an attempt to boost growth. He would also cut half a million public sector jobs as part of a drive to shrink the state sector.